The Global Development Network (GDN) in partnership with the Bill & Melinda Gates Foundation announces an international essay contest. The contest invites essays on the future of development assistance. The primary objective of the contest is to invite fresh thinking related to the future of aid that can inform the ongoing discourse on development assistance and to make this thinking available to policymakers and key stakeholders. The themes for paper submissions are listed below. 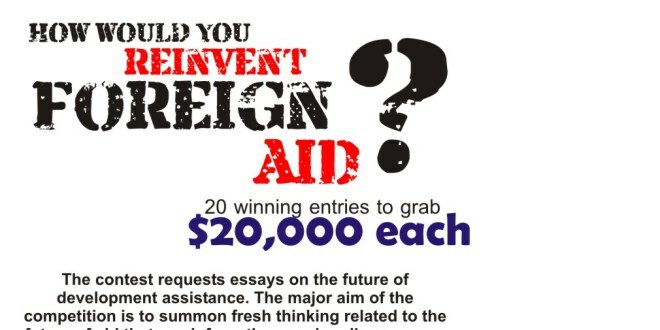 Up to 20 winning entries will be chosen, and receive $20,000 each. An independent panel will make the final selections of the best and most potentially consequential submissions, based on criteria defined. Select winning ideas may be promoted by GDN and the Bill & Melinda Gates Foundation. Age: Entry is open to all adult individuals over 21 years of age. Staff: Current employees, contractors and agents of the Global Development Network and, as primary funder for this round, the Bill & Melinda Gates Foundation, together with members of their immediate families (parent, child, sibling and spouse of each) and those living in their same household are ineligible to participate in the contest. Countries: Residents of Cuba, Iran, Syria, North Korea, Myanmar and Sudan are ineligible to apply. This program is void in these countries and where prohibited or restricted by law. Restricted individuals: Individuals included on the List of Specially Designated Nationals and Blocked Persons maintained by the U.S. Department of the Treasury’s Office of Foreign Assets Control are not eligible to participate in the contest. Reviewers and Translators: Reviewers, selection committee members and translators for this contest are not eligible to participate. Essay Cover Page: The cover page should display the title of the essay and contain an abstract of at most 250 words. Information on the author(s) should not be presented on the cover page or in the abstract. Information on the authors can only be present in the list of referenced documents. Essay documents containing author information in places other than the list of referenced documents will be liable for disqualification. Essay Word Limit: The main text should contain at most 5,000 words, not counting notes and reference lists. Sources should be cited consistently. The abstract should not be more than 250 words and must be included in the essay document. Essay Margins and Spacing Requirement: The format should be in Times New Roman, minimum 12-point font, 1 inch/2.5 centimeter margins. Essay Document and Page Formatting: The submission should be Microsoft Word .doc or .docx format. Essays in PDF will not be accepted. Essay Language: Essays can be submitted in the English, French and Spanish languages only. The competition is open in three languages. Guidelines are currently posted in English. The French and Spanish versions of the guidelines will be available as of 4 July 2014. Essays in English, French and Spanish can be submitted as of now on this platform. However, dedicated platforms for submissions in French and Spanish will also be available as of 4 July, 2014. For any queries or assistance on the Essay Contest, please write to GDN at nexthorizons@gdn.int. GDN will not entertain any phone calls from potential applicants.